Go to bed and wake up at the same time every day, even on weekends. Daylight helps set sleep patterns, so try to be outdoors while it's light out for 30 minutes a day. Exercise regularly (but not too close to bedtime). An afternoon workout is ideal. Keep naps short — less than an hour — and forgo napping after 3 p.m.
Avoid caffeine (found in coffee, many teas, chocolate, and many soft drinks), which can take up to eight hours to wear off. You may need to avoid caffeine entirely if you have panic attacks; many people who experience panic attacks are extra-sensitive to caffeine. Review your medications with a doctor to see if you are taking any stimulants, which are a common culprit in keeping people up at night. Sometimes it's possible to switch medicines. Avoid alcohol, large meals, foods that induce heartburn, and drinking a lot of fluid for several hours before bedtime. If you smoke, quit. 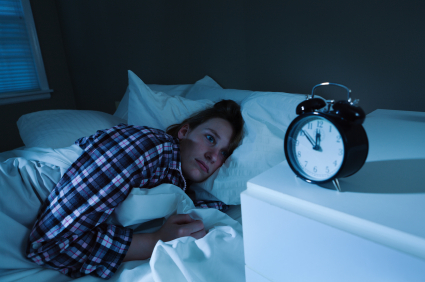 Smoking causes many health problems, including compromising sleep in a variety of ways. Keep your bedroom cool, dark, and quiet, without distractions like TV or a computer. Avoid using an electronic device to read in bed; the light from the screen can trick your brain into thinking it is daytime. If your mattress is uncomfortable, replace it. Reading, listening to music, or relaxing before bed with a hot bath or deep breathing can help you get to sleep. If you don't fall asleep within 20 minutes of turning in (or if you wake up and can't fall back to sleep in 20 minutes), get out of bed and do something relaxing until you feel sleepy. For additional tips and strategies for living with anxiety, buy Coping with Anxiety and Stress Disorders, a Special Health Report from Harvard Medical School.